COM-3802 COM-bHL6 | EMAC Inc. The SoM-212ES is an ultra compact SoM Carrier/Socket board with an optional 4.3 inch WQVGA (480 x 272) TFT color LCD and a resistive touch screen. SOM-7569 is a COM Express Mini module with type 10 pin-out that fully complies with the PICMG (PCI Industrial Computer Manufactures Group) COM.0 R2.1 specification. SOM-5893 is a COM-Express basic pin-out Type 6 module that complies with the PICMG (PCI Industrial Computer Manufacturers Group) COM.0 R2.1 specification. The brand new application-ready COMe-bHL6 offers increased performance density and up to twice the graphics performance compared to its predecessors. Up to three independent, daisy-chained displays with up to 4K resolution are supported to create stunning user experiences. Further to this, DirectX® 11.1 and OpenGL 4.0 support paves the way for compelling visuals when videos, graphics and interactive content are being displayed. 37.5x32mm package size (BGA1364 socket) see manual for more information on CPU support. 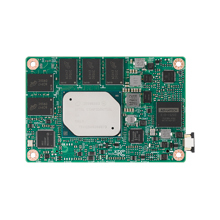 The 32nm Intel® 8-Series Platform Controller Hub Lynx Point PCH QM87 or HM86. » All solid capacitors (POSCAP). No tantalum capacitors used. » Real fast I2C with transfer rates up to 40kB/s. The brand new application-ready COMe-bHL6 offers increased performance density and up to twice the graphics performance compared to its predecessors. Up to three independent, daisy-chained displays with up to 4K resolution are supported to create stunning user experiences. Further to this, DirectX® 11.1 and OpenGL 4.0 support paves the way for compelling visuals when videos, graphics and interactive content are being displayed. By integrating the new Intel® AVX2 and OpenCL 1.2, Ths new Computer-on-Modules additionally not only provide an increase in floating-point performance they also possess improved parallel processing capacities. Typical application areas can be found in markets such as digital signage, professional gaming and entertainment, medical imaging and surveillance and security as well as industrial plant and machine line control on shop floor- and control room-level. 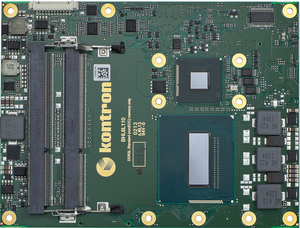 Engineers can immediately commence with evaluating these new benchmark Computer-on-Modules on all COM Express® pin-out type 6-compliant starter kits.